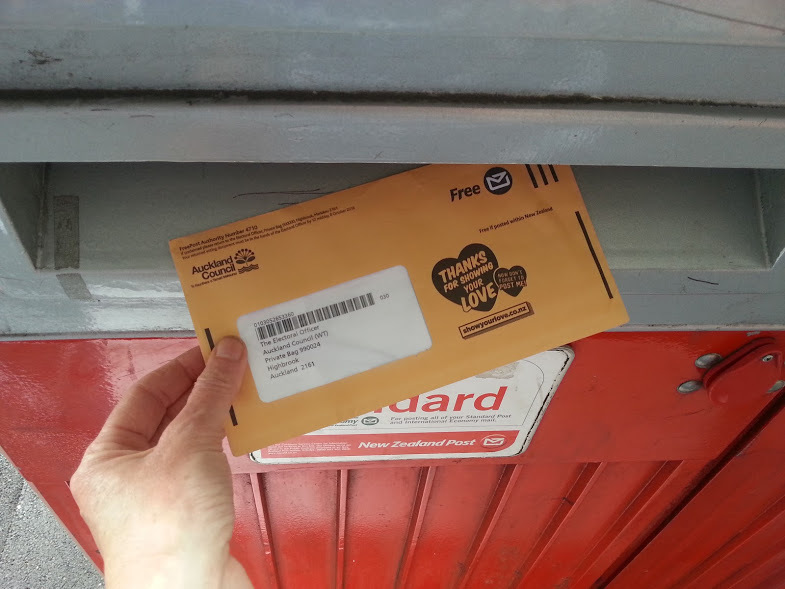 With only three days left to post votes in the Auckland Local Elections 2016, City Vision is calling for an urgent review of the local body election voting system. City Vision Chair Robert Gallagher is concerned that turnout figures are low, and look set to fall well below fifty percent for the second consecutive election. The process for nominating candidates. The fact that nominations are hand-written and electronic photos are not accepted has led to errors in the voting booklet. City Vision candidate Peter Haynes was wrongly recorded in the voting booklet as living outside his ward area. That will cost Peter votes. The effectiveness of postal voting. There are significant barriers to postal voting. Many young people simply don’t use postal services, and NZ Post has significantly reduced the number of post boxes. Other options for voting including more publicly accessible voting places, the notion of a focussed ‘election day’, and further consideration of whether electronic voting can be done in a secure way. The confusion that is created by the use of two different voting systems. FPP is used for most of the positions, but STV for the District Health Boards”. Councillor Cathy Casey says she is concerned at the number of voters who claim that they have not received their voting papers. As at 30 September voting document returns were at 18.28%. Voting documents must be posted by 5 October to arrive in time for Election Day. Voting documents can be hand delivered to special ballot boxes at selected locations including local libraries up until midday on 8 October. Enrolled voters who did not receive their voting documents need to call 0800 922 822 to arrange a special vote.